Not pictured above is Kenneth C. Strough - WG who took this photo of FURLOUGH MYRTLE and her crew. 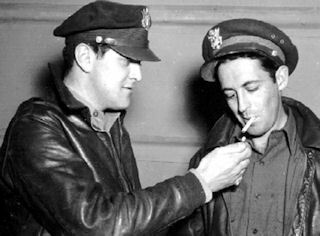 On the left are 100th BG pilots 1Lt William R. Flesh and 1Lt John G. Gossage. Photos are courtesy of the 100th BG Photo Archive. The Flesh Crew was originally assigned to the 100th Bomb Group, then after 11 mission, transferred to the 482nd Bomb Group Pathfinder Group at Alconbury on 26 Nov 1944. Most of the crew then joined the 303rd BG on 25 Jan 1944. 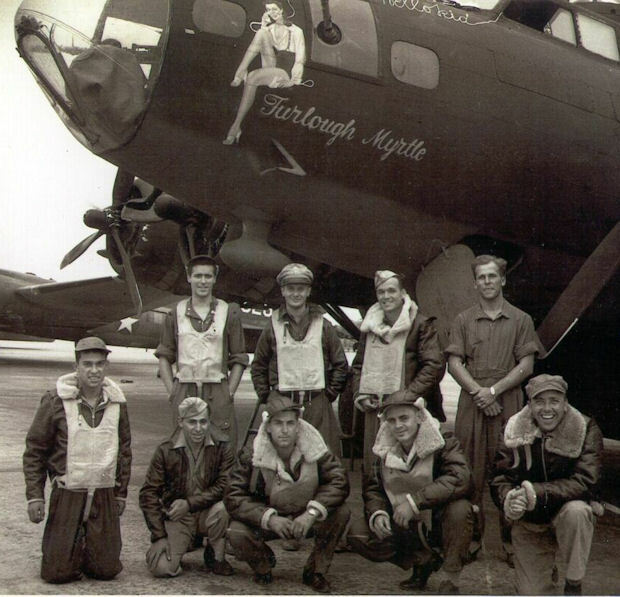 Albright and Price were also from the 100th Bomb Group. They were in the original Crew of Lt Victor Reed. Pilot, CoPilot and Enlisted Crewmen flew combat missions, on detached service, with the 305th BG(H), who was providing Lead Crews to 1st Division Bomb Groups - We have no record of these missions. 1Lt William R. Flesh (P) - All missions as a combat crew pilot. Completed combat tour on 13 April 1944. Volunteered for a second combat tour as a Lead Crew Pilot. 2Lt Americus V. Combs, III (CP) - Missions flown: As Flesh Crew CoPilot - 102, 103, 104(A), 115, 116, 118, 119, 122, 123; As 1st Pilot - 135, 136, 138. Completed 30 mission combat tour - mission 138 - 20 April 44. 1Lt Robert V. Doyle (N) - Missions Flown: William R. Flesh crew - Seven missions (102, 103, 104(A), 107(AS), 115, 116, 118) ; George W. Shope, Jr Crew - Six missions 53, 54, 55, 56, 57(A), 59); Howard C. Ness Crew - 5 missions (72, 73, 74, 77, 78); Seven Other Pilots - Nine missions (51, 60, 63, 64, 65, 69, 114, 117, 118). First mission (51) 17 July 43. Completed 25 mission combat tour - mission 118 - 6 March 1944. 1Lt John J. Reeder (B) - Missions Flown: William R. Flesh Crew - Five missions (102, 104(A), 107(AS), 115, 116); George W. Shope, Jr. Crew - six missions (53, 54, 55, 56, 57(A), 59); Howard C. Ness Crew - five missions (72, 73, 74, 77, 78); Four other Pilots - five missions (51, 63, 64, 114, 117). First mission (51) 17 July 1943. Completed 25 mission combat tour - mission 117 - 4 March 1944. T/Sgt Glenn N. Albright (E) - Missions flown: William R. Flesh crew - Ten missions (102, 103, 104(A), 107(AS), 114, 115, 116, 118, 119, 122). Completed 25 mission combat tour on 18 March 1944. T/Sgt John J. Murphy (R) - Missions flown: William R. Flesh crew - Fourteen missions (102, 103, 104(A), 107(AS), 114, 115, 116, 118, 119, 122, 123, 126, 127, 129). Completed 25 mission combat tour on 27 March 1944. S/Sgt Richard M. Price (BTG) - Mission flown: William R. Flesh crew - Nine missions (102, 103, 104(A), 107(AS), 114, 115, 116, 118, 119. Completed 25 mission combat tour on 8 March 1944. S/Sgt Kenneth C. Strough (LWG) - Missions flown: William R. Flesh crew - Eleven missions (102, 103, 104(A), 107(AS), 114, 115, 116, 119, 122, 123, 126). Other Pilots (125, 126). Completed combat tour on 23 March 1944. S/Sgt John P. Williams (TG) - Missions flown: William R. Flesh crew - 12 missions (102, 103, 104(A), 107(AS), 114, 115, 116, 118, 119, 122, 123, 126). Other pilots - two missions (125, 126). Completed combat tour on 23 March 1944.